On the image, you can see a Japanese candlestick chart fragment consisting of 13 bars, of which 6 are bearish and 7 are bullish. High — the highest price during the period, which this bar is representing. Low — the lowest price during the period. Open — the price at the beginning of the period. Close — the price at the end of the period. Body — the part of the candle that stretches from Open to Close price levels. The length of the body is calculated as Close − Open. Upper Shadow — the part of the candle that stretches from Close to High. The length of the upper shadow is calculated as High − Close. Lower Shadow — the part of the candle that stretches from Open to Low. The length of the lower shadow is calculated as Low − Open. 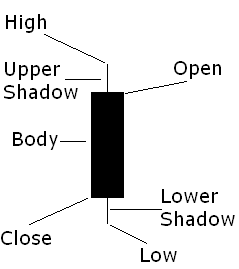 Body — the part of the candle that stretches from Open to Close price levels. The length of the body is calculated as Open − Close. Upper Shadow — the part of the candle that stretches from Open to High. The length of the upper shadow is calculated as High − Open. Lower Shadow — the part of the candle that stretches from Close to Low. The length of the lower shadow is calculated as Low − Close. Now you know the basics of the Japanese candlestick charting and you can easily interpret the charts that are represented by candlestick bars. 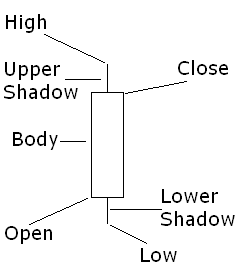 Japanese candlesticks are a great tool to use in trading, and the charts that are built on them are very easy to read. Additionally, many Forex traders find it easier to build strategies using such charts.